Creating art is the most beautiful thing in my life. I'm very glad about every tiny support I get - let it be comments, favorites, watches, features or anything else - thank you very much! This is my competition for the "Mr. Glass competition"
I created the artwork by sculpting the character, rendering a base picture in Keyshot and painting over it in Photoshop. When Mason Denver was 8 years old, he was watching the work of his father at a biological laboratory. His father spend all his time there to find a cure for cancer because Mason's mother was slowly dying from it. At this certain time the scientist dad was sure to be on the right track by experimenting with the cells of patients with stoneman disease. He thought that there might be a possibility to use the killing mechanism of the one disease to kill off the other. The cells from the stoneman patients could petrify the cancer cells. Mason would stand behind the Glass and watch, waiting for his Daddy to finally spend some time with him. But this time never came. When the train accident happened, the laboratory was nearby and got razed to the ground. Almost all of the people present got killed – except for Mason, because he was small enough for the wall ruins to not smash, but shelter him. Heavily injured, he got transported to and rescued in the hospital. But what no one knew: the stoneman cells came in contact with his injured body. They infiltrated it and caused a strange mutation amplifying his bone structure and disfiguring his face and body even more. This and the death of both his parents (his father didn’t survive the accident and his mother died shortly after that due to the stress) caused him to become an even more shy, insecure and withdrawn child. Luckily, he was taken in by a foster family. The new family was nice and caring but busy as well. From this day on, Mason would spent most of his time inside and distracting himself with his computer and hobbies like fixing things. He thought: if he wasn’t beautiful himself, he could at least make other things beautiful. Still, he had his psychological trauma and other problems to deal with – his disfiguration and shyness making him the perfect bullying victim. One day in his puberty, Mason got in a very intense argument with his foster parents. He then found out that the disfiguration wasn’t the only mutation that happened back then with his body. When he was at the peak of his emotional state, he accidentally petrified and thus killed both his foster parents by amplifying their bone and muscle structures which smashed their inner organs while doing so. Horrified he ran away. But he was a smart kid, so he knew how to care for himself. And he knew that he had to keep his emotions in check or otherwise this would happen again and he certainly didn’t want that. So he searched for a therapist and became the patient of Dr. Fletcher. Quietly and always trying to hide from social interactions, he later found a job at a software development company where he could work from home. The years passed by and while still working from his home he turned his hobby from fixing things into Kintsugi. This was a Japanese craft he discovered when he made one of his rare strolls through the city wearing his hoodie and he found himself at an art market. An old lady was selling the bowls and cups she fixed with gold particles. Such a beautiful and mindful craft. He was so disgusted by the modern society always throwing everything quickly into the trash, ending relationships without a second thought and generally not trying to fix things, that he fell immediately in love with this fascinating craft. Also he could release his anger with crashing things and fixing them in this way afterwards. Mason became very good at it as well and gifted one refined bowl to Dr. Fletcher as she seemed to be the only person caring for and understanding him. Someday though, when he found out that the therapist was killed, his emotions sparked again and he wanted to kill off the people responsible for that. He was devastated to be left alone once again. With the training during the therapy though, he was able to control himself better and not just kill off the first person he saw. Instead, he carefully analyzed the events and waited patiently for his time to come – his revenge would be sweet. He knew that some kind of beast was responsible for the murder, but it had disappeared too quickly from the scene. Weeks later though, Mason found out, that the beast got captured and brought into the institution for the criminally insane as well as some other rather strange guys. This wasn’t supposed to happen this way. He was furious and tried to calm down. His revenge still needed to be made. Otherwise he would never find rest again. Still, he kept low-key and watched the events unfold. Especially on Casey he kept an eye from afar, since he found out about the connection between her and the beast. But as he started secretly stalking her, three things happened: Firstly, he got to know that the whole case was much bigger and more complicated than he suspected. He learned that Mr. Glass was responsible for the train accident back then causing him to be who he was, that the beast was a mere victim himself and that these both and this David Dunn were arrested by Staple – a not so trustworthy person herself. Secondly, as he watched Caseys actions and researched more about her, he couldn’t stop himself, but develop some kind of feelings for her – feelings, he never felt before and blamed himself for. And thirdly, then the events of the escape happened, where he watched the three main men die. After Mr. Glass events: Everything was so wrong. After Elijahs message is made public, Mason decides to get involved. He gets in contact with Casey since he still wants his revenge and Dr. Staple with her Clover Organization is his new target for that. He knows, this organization is the true danger and also he just wants to meet Casey in person, not telling her about his feelings, but just being around her. After a rather awkward introduction they both start a conversation and insecure, but honest he tells her everything about his former motifs, history and his powers as well as what he learned about the organization responsible for Kevin’s death. Casey firstly frightened, but then calmly replies that she also wants revenge for Kevin and to tear down this dangerous organization. Mason and Casey team up with the remaining characters and make a plan to take the organization down. But they get pretty frustrated, since they can’t do much without the powers of Kevin, Mr. Glass and David. While making plans, Mason discovers that he is not only able to kill people, but to possibly revive them as well: While working together, Mason watches Casey being sad about a killed bird and as his feelings for her are rather strong he suddenly watches the bird flapping his wings again in Casey’s hands. He rebuilt the biological structures the bird was missing and brought him back to life. They both stare in awe and realize what this could mean. In the coming events, they test Mason’s powers and use it to revive the deceased three men: Mr. Glass, David Dunn and Kevin Wendell Crumb. Now they have the chance to take down the organization. While Mason has to watch Kevin and Casey getting uncomfortably close together, a fight between good and evil and between the organization and the so-called-heroes unfolds. All the while Mr. Glass, of course, develops some plans of his own. Maybe you've already heard of it, but I created my very first digital drawing course on portraits using Photoshop and it went online this week. Today at midnight the launch will end, which means that only until then you will be able to get the course with 50% discount and also only now with a special resource bonus package consisting of 3D models and exclusive reference pictures. It is German, but has English subtitles and resources - so it's completely understandable in both languages. Grab your lifetime access for the course here. Du möchtest Menschen oder generell digital zeichnen lernen? Dann bist du hier genau an der richtigen Adresse. Ich möchte Menschen wie dir helfen, die Hürde zu überwinden, die ich damals selbst nur so mühevoll im Alleingang bewältigen musste. Hätte ich damals das Wissen von heute gehabt... oh my.. vieles wäre so viel einfacher gewesen und hätte weniger Zeit benötigt. In meinem Kurs habe ich daher all das und mehr zusammengetragen, um sowohl kompletten Anfängern als auch fortgeschrittenen digitalen Zeichnern zu helfen, ihre Fähigkeiten zu verbessern. Der Kurs ist nun hier erhältlich. Und nur für kurze Zeit, bis zum 29.3. gibt es dabei 50% Rabatt sowie eine 30-Tage-Geld-zurück-Garantie! Wenn du Fragen hast, kannst du dich gern jederzeit an mich wenden. 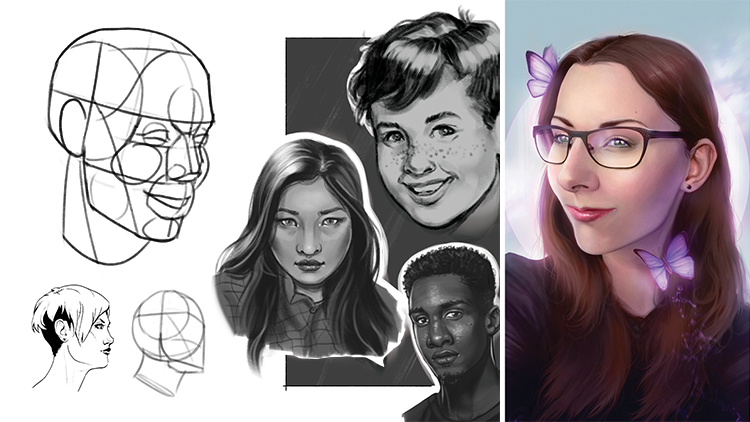 You want to learn to draw people or digital in general? Then you have come to the right place. I want to help people like you to overcome the hurdle, which I had to overcome only so laboriously at that time alone. Had I then had the knowledge of today... oh my... much would have been so much easier and would have taken less time. So in my course I gathered all that and more to help both complete beginners and advanced digital artists improve their skills. The course is now available here. And only for a short time, until 29.3. you get 50% discount and a 30-day money back guarantee! I just uploaded a video on how to draw eyes on my youtube. It is an excerpt of my upcoming portrait drawing course (German dubbed with English subtitles). Sadako-xD has started a donation pool! If you like my art, please donate some points .